If there's no "Honourable" in the heading to this letter, it's not me disrespecting. Most likely, it's this really tall, dark-and-lovely guy whodunit: Edmore Zvinonzwa, the Production Editor of this popular Sunday paper, simply "Ed" to me. See, Honourable Kirsty Coventry, I have since adjusted my mindset to the new paradigm - that you were now so darn-important in our country, you most-likely had the hallowed private digits to President Emmerson Mnangagwa, and he had yours too; and that you could possibly do a tea-and-biscuits with him on a moment's notice. Anywhere in the world, that is fantastic, can't-be-bought-with money VVIP class and influence. You have surely "arrived". But then, you have always been important; in fact, very, very special to millions of Zimbabweans around the world. Since that night; specifically August 20, 2004 - the night you did it at the Athens Aquatic Olympic Centre, flooring an unbeatable field of the very best athletes in the world to bag an Olympic gold medal in the 200M Backstroke. Wow! 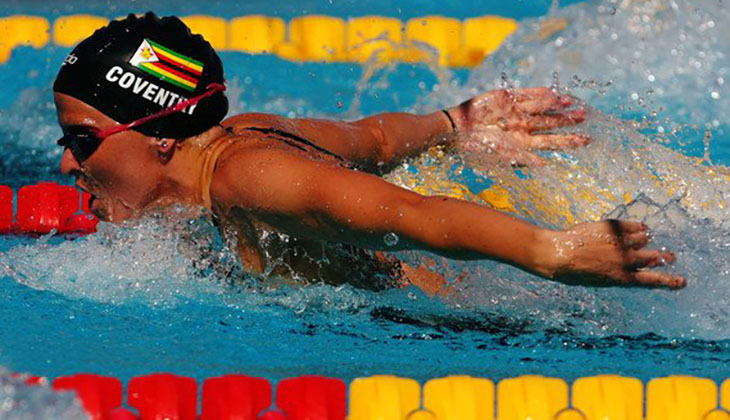 Zimbabwe's first-ever individual Olympic gold. Not even the uninterested, Good-Old-Bob could resist your charm. He hastily-organised a little sacksful of loot, and that revered red passport that our ill-deserving, foolish and self-important parliamentarians have cried fake tears for. It's not coming their way. Not in this ridiculous Ninth Parliament. Not ever. Eat-your-heart-out parliamentarians as you continued with your Mickey-Mouse bickering in that seemingly no-longer-important legislature. You never belonged in the glorified, cool, Diplomatic Passport Class anyway. See, Honourable Kirsty, your magic still thrilled, years after you hung up your, err, swimming costume (nearly blurted-out "knickers", but I didn't!). The undeclared but well-known lady-killer, one ED, by some act, in the most-unlikely of appointments, elevated you to the hallowed position of minister of Youth, Sport, Arts and Recreation. Wow! Honourable Kirsty, my take was always you're never truly-popular/successful till reference to you is in just one name; akin to Pele, Tiger, Messi, our own one-and-only Peter etc. You now belonged to that known-by-one-name-only class; the idol worship you enjoyed in Zimbabwe as simply "Kirsty" and across the world aside, your work at home was cut out. Daunting even. I got one, two, three, four, five issues for you Kirsty. You must, should tackle these once-and-for-all. No ifs, no buts. One: Just a few days ago, we watched the men's Under 20 national soccer team, the "Young Warriors", weave a little magic (none like yours though) and nearly-upset the highly-rated South Africa, in the final of the COSAFA U20 tourney in Zambia. Something else uninspiring stood out. Just like their netball compatriots who were playing in South Africa, as witnessed right across Africa, on satellite TV platform, DSTV, their kit was most-unappealing. It is not the done-thing for any association to walk into a backyard tailor's shop and wait while a kit for a national team was hurriedly stitched-up. But your national squads were in the habit of such a backward, apathetic practice. Your oversight body, the Sport and Recreation Commission never gave a damn. Disappointing. I have not much space to vent, but you know all about apparel and its aesthetics, and fit, and comfort and national pride. Please fix that. Some legislation would help to take out the stupidity regarding important national kit, its colours and the design. Number Two: as a former rugby executive board member, I was super-proud and especially happy for the 7s squad that won the Africa Cup after beating Kenya in the final and bringing the trophy home just two months ago. It's a rare event for any national Zimbabwean sporting squad to bring home a prized, continental trophy. My point is, could Zimbabwe start rewarding, handsomely, beautifully, attractively, any such conquests? Not with a red passport. In 2018 and beyond Honourable Kirsty, money is all a professional athlete wants. I await to hear that the particular 7s squad has been rewarded and that the lads were happy about it. In the event that you didn't know, leading international magazine, Psychology Today teaches that motivation was the foundation of all athletic effort and accomplishment. Without that motivation, physical conditioning, technical and tactical training, general lifestyle including sleep, diet and all of the other mental factors; confidence, intensity, focus, may suffer. In 2018, financial reward is the biggest motivator for athletic achievement. Let's dispense with the demotivating monkey business of rewarding our national athletes with peanuts. Three-of-five; please do something about the national team nicknames. Presently, it's an embarrassing hotchpotch of anything goes. The Zimbabwe national men's soccer team was christened the "Warriors". I love that. Meaningful, maybe even a bit fear-inducing to any opponents. A marketer's dream too for any potential branding. The women's squad became, somehow prefixed with "Mighty" to Mighty Warriors. I don't know about that. The men's Under 23 side, lazily, became the "Young" Warriors. Ditto the U-20, U-17 sides and so on. The same "young" also repeatedly prefixes the various women's sides. Rubbish. The national cricket team was the "Chevrons". Unless if I was totally uninformed, a chevron is a mere pattern, the most-common one in Zimbabwe being the mandatory safety reflector on the back of heavy trucks. Now, surely a mere chevron being a useful nickname for a whole national squad? You are kidding me! Four. Would you ensure that each national team travelling abroad had APPROVED, desirable, safe travel plans, preferably dictated by some legal instrument? I know what I am talking about. I have travelled for many years with various national squads, across codes and often, the travel plans were plucked from hell and unsafe too. Please do personally take a keen interest in how each and every national squad travelled. Five-of-five: This one is a no-brainer. In the interest of spoiling bad governance, please descend mercilessly like an evil hammer on any registered association that evaded producing audited financial and management accounts. No point belabouring this simple and vital fact. Public funds were sacrosanct and ought to be safeguarded from shameless thieves in suits. Honourable Kirsty Leigh Coventry, your enchantment knew no bounds. Many still believed in your ability to spin magic and transform our comatose sport. I do. It will be one day at a time, but some issues clearly demanded attention, like "yesterday."